Hotel Morales was originally known as the House Verea, a two-story Colonial house constructed in the 19th century and owned by Luis Verea. In 1930, Luis Morales expanded and renovated the building into a luxury hotel: Hotel Morales. Due to Mr. Morales’ passion for “toros,” the hotel became popular with people connected to the bullfighting world. The hotel bar and old barbershop served as popular meeting spots where people would gather to discuss bullfighting. 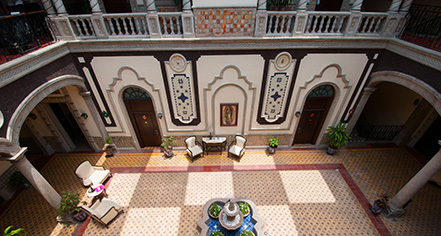 Over the years, Hotel Morales hosted famous bullfighters, Mexican politicians, and celebrities from the Golden Age of Mexican cinema, such as Maria Felix "La Dona", Pedro Infante, Jorge Negrete, and Mario Moreno "Cantinflas." Renovated and restored in 2006, the Hotel Morales’ 98 luxurious and cozy guestrooms are decorated to highlight its Colonial past. The accommodations feature hardwood floors, flat-screen televisions, WiFi, air-conditioning, and coffee makers. Guests can dine on authentic Mexican and International cuisine in the hotel restaurant, El Ruedo, and relax with a cocktail at El Encierro bar while listening to live music. The concierge can assist with restaurant reservations and tour tickets, and guest can unwind in the hotel’s pool and fitness center after spending the day touring the city. Hotel Morales is located in Guadalajara’s Historic Downtown, only a few blocks from the Metropolitan Cathedral and the Degollado Theater. This unique and historic building is protected by the Instituto Nacional de Antropologia e Historia (National Institute of Anthropology and History). 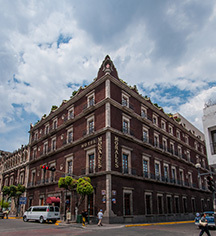 Hotel Morales, a member of Historic Hotels Worldwide since 2016, dates back to 19th Century. Due to the owner’s passion for bullfighting, Hotel Morales was known as a meeting place for bullfighters and its fans, celebrating in the hotel bar until dawn. Pet Policy: Service animals allowed: No. Pets allowed: No. Hotel Morales was originally known as the House Verea, a two-story Colonial house constructed in the 19th century and owned by Luis Verea. In 1930, Luis Morales expanded and renovated the building into a luxury hotel: Hotel Morales. Due to Mr. Learn more about the History of Hotel Morales .